This post is part of A Biblical Foundation to Hear God’s Voice series. Remember, we began this series last year, and I took a break from it. Now we are continuing with the rest of the series. See the links at the end for the whole series. 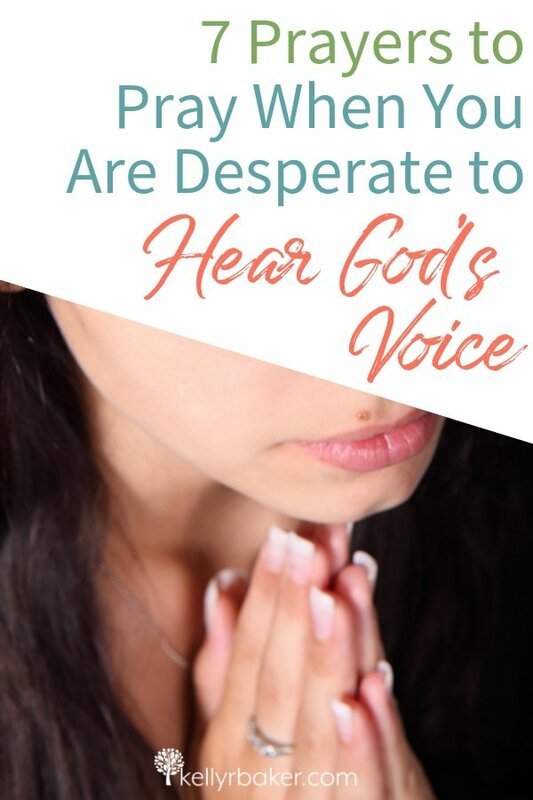 Have you ever been desperate to hear God’s voice? You know, when it’s like you have to hear from God—now! I don’t know about you, but I’m usually desperate to hear God’s voice when I’m seeking direction for my life for a time related or important decision. We cannot discount the power of prayer during those times. I sure don’t want to miss Him or be deceived. The following is a sampling of what I do to build my faith and talk to God concerning His will for my life. I put Scriptures before me that remind me He is leading me. I pray what the verse says, which is under each verse below. You can’t go wrong when you’re praying the Word. I invite you to pray the following verses over yourself and the declarations after them. It will cause you to believe what is true, and what you believe will take you to your destiny. Faith comes by hearing the word of God (Romans 10:17). When we pray the Word, it causes our mind and heart to line up with what is true. The Spirit of Truth guides me into all truth and only truth. You are my Shepherd; I am Your sheep. I clearly hear, know and follow Your voice, Lord; I flee from the voice of the stranger. I take You at Your Word. Father, You have promised to show me the path of my life. I thank You that You are at my side! I need Your wisdom, Father. You promised to give me an abundance of wisdom if I only ask, and I’m asking now. I’m going to ask, seek and knock, Father. I’m asking and seeking You now, knocking on Your door. And You said I will receive, I will find and the door will be opened. Lord, open the doors that pertain to Your will for my life and shut any others. Father, I humble myself before You. You said You lead and teach the humble. Let that be me. In Jesus’ name. Amen! I trust You, Lord, with all that is in me. I’m not even going to worry about those things I don’t understand. You are directing my path as I acknowledge You. There’s just one more thing you must do when you’re desperate to hear God’s voice. And try not to tune me out when you find out what it is. Replace that desperation with deep trust in Him. I know, I know. It’s easier to say it than do it, but praying that aloud will help you to make it into reality. It’s so important to release it all to Him because otherwise, when we want something so desperately, we will hear only what we want to hear! That’s our tricky heart that can get in the way, but it’s times like that I try to remember to seek His face and not His hand. That means I’m going to seek Him—discover His character and truth—and not just an answer to my needs. And when we’re in His presence, it’s time to stop and listen. Sometimes He will speak to us immediately, other times He will have us wait. Until we hear His voice, we can find peace in knowing He is working all things together for our good (Romans 8:28). What would you like to hear God about? What scriptures do you like to pray when you’re desperate to hear God’s voice? Encourage others in their walk with God! Use the icons below to share this post! I’m learning the power of praying scripture, it gets me out of my rut of asking, and reminds me to be thankful and to reflect on Gods power and mercy. Scripture is powerful in and of itself, and then when it is combined with the power of prayer and you Pray the Scriptures – BOOM! Power Packed Prayers. Kelly, I love this post and I especially love how you shared that we need to release and trust God – all too often when we desperately want something it is so true, that can be the only voice we hear. Thanks for sharing such a great power packed post. We can’t go wrong when we’re praying the Scriptures! Amen! Thanks for sharing, Kelly. Blessings to you! I love praying the scriptures! Such poetic power in the Word! I always love your prayers, Kelly. They help me feel closer to God and encourage me to seek connection to Him. Such a beautiful post!! It is so very true that when our mind is more focused on what we want, then we will be only listening to what we want to hear. I most definitely was reminded in this post that I must remain intentional in my prayer life and in continuing to be focused on only Him. Desiring only what he wants for my path. Thank you Kelly!! This makes so much sense especially when a believer is in constant communion with God.